The month of March was an exciting time for the Harper Park Stewardship Initiative (HPSI) as we were joined by new members AND attended the Community Stream Stewardship Program (CSSP) workshop held in Holland Landing, hosted by OFAH (Ontario Federation of Angler and Hunters). 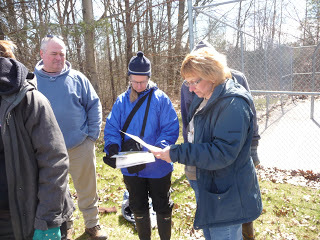 Stream stewards from all over Ontario attended this workshop. During this two day event discussion topics ranged from permitting to stream restoration techniques, with a large majority of the second day spent outdoors; this was a favourite portion of the course because despite the slightly colder weather, we all love to be outdoors! Meagan is demonstrating the correct technique in this picture. During the outdoor activities we were split up into two groups. 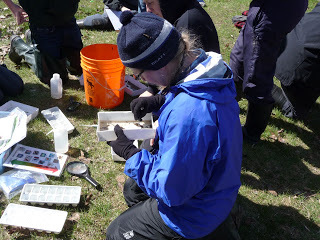 The first group learned about stream morphology and how to properly measure the width and depth of a specified channel. Meanwhile, the second group had some fun kicking around the stream bottom as we learned the kick and sweep method used for collecting benthic invertebrates. 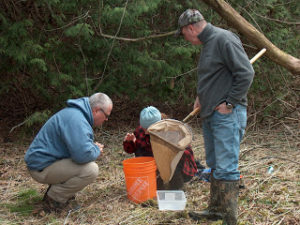 Andrea Hick, the CSSP co-ordinator, helps HPSI volunteers John and Roy identify benthic invertebrates. After collecting our invertebrates, we needed to identify them. The species of “bugs” found can tell us more about the quality of the water. 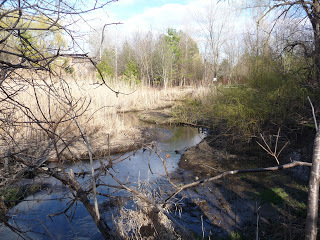 We had to transfer the stream water from the larger buckets to smaller containers so we were able to see the bugs in the murky water. Looks like Kim found something! 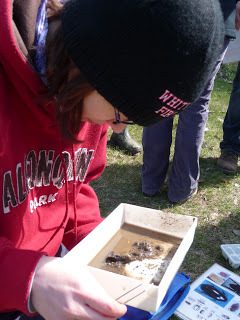 Everyone got a chance to search for bugs and by the looks of it Jess is having troubles finding any at all! 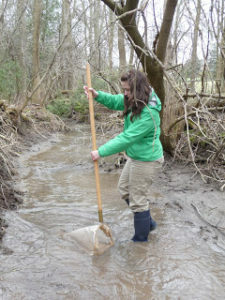 Jess spreads a portion of her sample out into a tray making it easier to find and identify stream invertebrates. A big thank you to the Community Stream Steward Program for an excellent workshop!